Lakeland Herdwick is the name given to meat (lamb or mutton) derived from sheep of pure bred flock of Herdwick ewes and rams that have been born, raised and slaughtered in Cumbria. In 2012, Lakeland Herdwick meat was awarded Protected Designation of Origin (PDO) status. 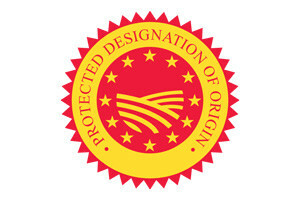 This is a European Standard of Food Protection and promotion ensuring the product’s quality and provenance ensuring its full traceability. This PDO status ensures consumer confidence in Lakeland Herdwick and helps to protect a centuries old traditional farming system. All Lakeland Herdwick is processed through the small family owned local abattoir “Aireys”. Est ablished in 1830 Aireys is a fully modernised facility with the highest standards of welfare and food safety. The Herdwick Marque was created by the Herdy Company as a symbol of Authenticity and Provenance To learn about the story of Herdy’s collaboration with HSBA visit Herdy Co .
Lakeland Herdwick meat is renowned for its distinctive flavour and quality – a natural result of the lambs maturing slowly on the heather, bilberries and grasses of the Lake District Fells. The meat is fine grained and tender and usually darker than commercial lowland breeds. This succulent meat has a more gamey flavour than conventional lamb and the mutton product is the most distinctive as it has had the time to develop the unique Herdwick flavour. A scientific study by Bristol University has also proven the superior flavour and increased levels of the “good fats” Omega 3 fatty acids deposited in the muscle as they age. The study concluded that the higher proportion of total fat and polyunsaturated fatty acids are positive attributes of Herdwick lamb. Herdwick sheep are regarded as a supreme example of a breed that is adapted to particular climatic and environment. They are recognised by their sturdy appearance, white faces and dense, slate grey fleeces. They are extremely active, hardy and strong boned with excellent foraging ability. The Herdwick’s hardiness and ability to graze over a wide area of fell is key to the maintenance of the Lake District landscape as we know it. Fell-farming is one of the most sustainable agricultural systems in the UK today, in which the needs of the wild habitat and those of the domesticated animals are balanced and nurtured. By purchasing Herdwick products you are giving the fell farmers who manage this World Heritage Site candidate landscape a sustainable future.